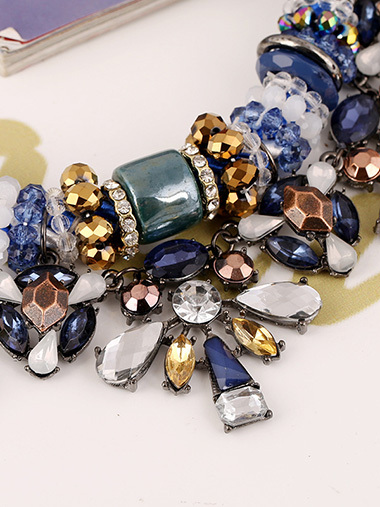 1, If squeezed, mosaic jewelry will be deformed and easily cause gem fall off, so it is better to take the jewelry off when bathing, sleeping or taking bus. 2, Some gems are fragile, such as emeralds, and even hard diamonds also have four division direction, so when crashing hard objects, there may crack, therefore don't wear jewelry during sports and work. 3, Avoid contacting the jewelry with cosmetics and corrosive cleaning agents, besides, far away from heat sources, X light and radioactive substances. 4, Organic gems such as pearls, coral, are fear of acid corrosion, sweat is also an organic gem killer, thus avoid contacting such stones with vinegar, acidic cleaning agents, if you are going to store the pearl jewelry, use a towel to wipe it with some olive oil, which can make the pearl beautiful and maintain its humidity, avoid surface cracking. 5, When washing your hands, plug the water outlet to prevent the ring losing, besides, prevent the soup infiltrate the crater. 6, Grease staining on the diamond surface will affect the flame and bright of the diamond, you can immerse the gem in lukewarm soapy water, and then scrub it with a soft brush, then rinse with lukewarm water and dry. 7, It is best not to wear much rings in the same hand, in order to avoid friction damage, do not wear jewelry of different materials at the same site, to prevent contamination of each other's color. 8, When storing, place the statement jewelry into a box and cover with a cloth, different jewelry should be placed separately to avoid friction scratches. 9, Jewelry should have regular maintenance and inspection. You can regularly clean it and can also take professional inspection and maintenance, which can effectively extend the service life of jewelry.